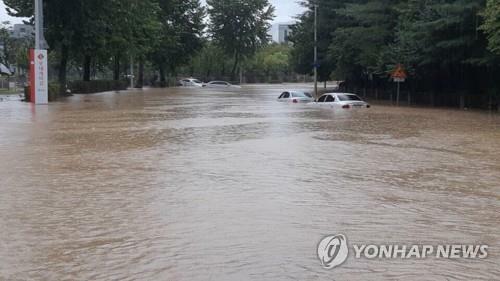 SEOUL/GWANGJU/DAEJEON, Aug. 28 (Yonhap) — Heavy downpours flooded homes, roads and farmland in central and southern South Korea on Tuesday, adding to the woes of regions already battered by a typhoon last week. Up to 455 millimeters of rain fell in South Jeolla Province in the country’s southwest between Monday and Tuesday, with more than 70 mm falling per hour at some points in some areas, according to the state weather agency. The downpours came after Typhoon Soulik pummeled the regions last week. 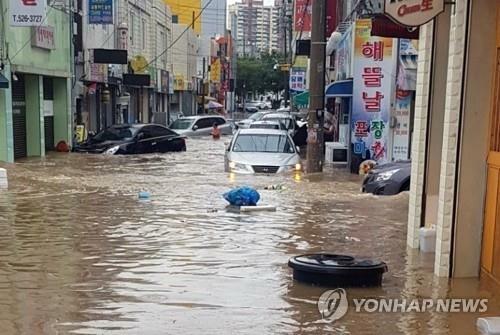 Local government officials said that the typhoon and torrential rains caused a total of at least 9 billion won (US$8 million) in property damage in South Jeolla Province alone. As of 10 p.m., the authorities had issued heavy rain advisories on Seoul, surrounding Gyeonggi Province and northeastern Gangwon Province, urging people to brace for possible damage as more rain is forecast to come until Wednesday.